The economy is perhaps the central topic of political debate in the world today. Yet familiarity has obscured the concept’s novelty. Far from being a natural feature of social life, the economy has a history—in crucial respects, a surprisingly recent one. “Inventing the American Economy” considers the place of the United States in this history, exploring the intellectual, economic, and political shifts that allowed the economy to become an object of governance and a way of understanding the divisions of collective life. 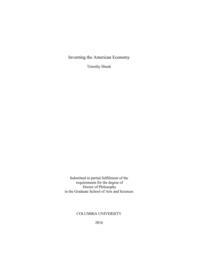 Offering a coherent narrative of a history that has been addressed in more scattershot form elsewhere, centering it on the experience of the United States, and pushing the chronology into the second half of the twentieth century, this dissertation analyzes the recasting of politics brought about in the twentieth century by the rise of the social sciences, above all economics. Weaving together studies of the economists who made this transformation thinkable, the institutions that supported their work, and the novel styles of governance that became possible as a result, “Inventing the American Economy” examines the process by which an academic conceit became a cultural fact.